Group 1: a group with an emphasis on supporting each other with respect to the various people we meet in our everyday walks of life – since we feel called to ‘heal those with a sad heart’. Valuing people for who they are we aspire to listen, affirm, encourage and pray for them. In our meetings we root ourselves in God with a scripture and/or worship exercise. We see ourselves learning to work against the prevailing culture of self-interest, actively listening to God in order to be faithful in serving Him. Group 2: a group with an emphasis on fellowship, with mutual support of both a prayer and practical nature. Our meetings focus on Bible study as our core means to build each other up. Each of us have different avenues of volunteering, serving, outreach and work. We bring the opportunities and difficulties that these present to the group to pray through, seeking to encourage each other. Group 3: a group meeting in the St. John’s area, with a specific focus on the St.John’s part of the city. We encourage and prayerfully support one another in our walk with Jesus, and growing in Him. As a group we try to encourage one another to try new things that they may not have done before, e.g. 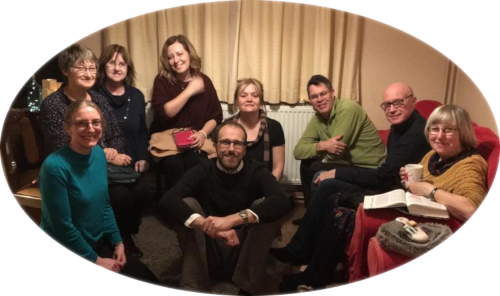 leading a bible study, or facilitating creative times of prayer. It is a safe place to ‘ have a go’! We have been practically serving our community in different ways, and have seen God answer our prayers. We look to build on this further! Blokes Group: a group of guys who meet with a specific focus of how we relate our faith to our workplaces. Placing a high value on being committed to each other, we look to support one another beyond our meetings, and accept that members’ work/travel commitments often impinge on being able to get to our gatherings. Sometimes it works out that just a few of us meet down the pub! We currently use a range of media specifically prepared for men’s groups to seed our discussions. We also organise and make happen ‘Dads & Kidz‘ Saturday morning events which have created an open door for newcomers and people not in the church.